CAIRO Egyptian authorities on Thursday authorized police to use deadly force to protect themselves and key state institutions from attacks, after presumed supporters of the deposed Islamist president torched two local government buildings near the capital in the latest of a series of apparent reprisals to follow a bloody crackdown on their protest camps. The Interior Ministry, which is in charge of national security, said in a statement that the new measures come after an angry crowd stormed the buildings in Giza, the city next to Cairo that is home to the Pyramids. "The ministry has given instruction to all forces to use live ammunition to confront any assaults on institutions or the forces," the statement read. Attackers set fire to churches and police stations across the country on Wednesday after security forces assaulted two Cairo sit-ins where thousands of supporters of ousted President Mohammed Morsi were camped out. 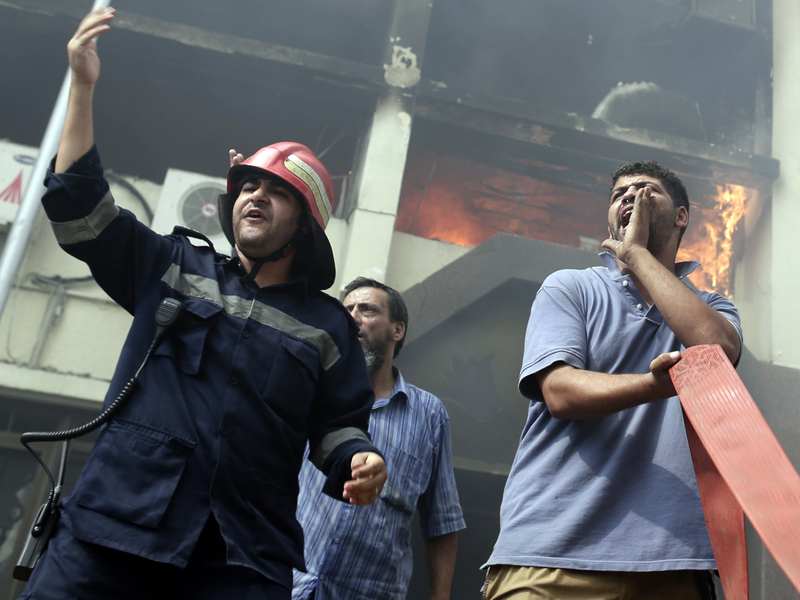 On Thursday, Egypt's Health Ministry raised the death toll from Wednesday's violence to 638. Ministry spokesman Mohammed Fathallah told The Associated Press that the number of injured in the previous day's violence also had risen to 3,994. Meanwhile, Egypt's military-backed government pledged in a statement to confront "terrorist actions and sabotage" allegedly carried out by members of Morsi's Muslim Brotherhood group. "The Cabinet expressed its determination to confront the terrorist actions and sabotage by elements of the Muslim Brotherhood organization," it said. "These actions are carried out as part of criminal plan that clearly aims at toppling down the state." In the United States, on Martha's Vineyard in Massachusetts, President Obama delivered a plea for restraint, urging the interim government to respect the rights of protesters and urging the protesters to demonstrate peacefully. Mr. Obama announced the U.S. had cancelled upcoming joint military exercises in response to the violence. Late Thursday afternoon, the U.S. State Department also issued a new travel warning urging U.S. citizens in Egypt to leave because of the unrest and strongly urging Americans staying in the country to avoid all demonstrations. The U.S. Embassy in Cairo was closed Thursday after the previous day's clashes. According to a statement the Pentagon released Thursday, U.S. Defense Secretary Chuck Hagel called Defense Minister Gen. Abdel-Fatah el-Sissi, the leader of the July 3 coup. Hagel said in the statement that the U.S. would continue to "maintain a military relationship with Egypt. "But I made it clear that the violence and inadequate steps towards reconciliation are putting important elements of our longstanding defense cooperation at risk," Hagel said. On Wednesday, the government declared a nationwide state of emergency and a nighttime curfew. Associated Press reporters witnessed the burning buildings in Giza  a two-story colonial-style villa and a four-story administrative building. The offices are located on the Pyramids Road on the west bank of the River Nile. State TV blamed Morsi supporters for the fire and broadcast footage showing both structures burning as firemen evacuated employees from the larger building. The Brotherhood website Ikhwanweb said thousands marched through Giza but were attacked by pro-military "militias." It did not say how the government buildings were set on fire. In the coastal city of Alexandria, witnesses and a security official said, Morsi supporters stabbed a taxi driver to death for hanging el-Sissi's picture. "The driver was caught in middle of a protest by the Muslim Brotherhood chanting against the military. He argued with them to watch out, they pulled him out (of his car) and stabbed him," said Mohammed el-Mashali, a reporter for the al-Fagr weekly who said he witnessed the killing. The official spoke on condition of anonymity because he was not authorized to speak to the press. Tamarod, the youth movement that organized mass rallies calling for Morsi's ouster, said citizens should set up neighborhood watch groups to protect government and private property. Meanwhile, successive attacks on Coptic Christian churches continued for a second day, according to Egypt's official news agency and human rights advocates. Egypt's MENA agency said Morsi supporters set fire to the Prince Tadros church in the province of Fayoum, nearly 50 miles southwest of Cairo. Ishaq Ibrahim from The Egyptian Initiative for Personal Rights says his group has documented as many as 39 incidents of violence against churches, monasteries, Coptic schools and shops in different parts of the country on Wednesday.